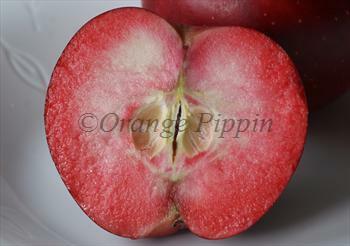 Tickled Pink (Baya® Marisa) is a new dual-purpose apple variety with a remarkable and unusual red flesh. We worked alongside the Frank P. Matthews nursery in the West Midlands to introduce this new variety to the UK in 2011. 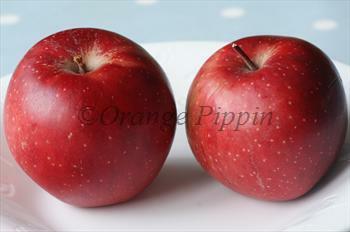 It is amongst the best of the true red-fleshed apples for eating flavour. On the tree the apples appear just like any other red apple, but cut one open and the striking red flesh is revealed. The flavour is tart but pleasantly mild, and the flesh is very juicy. The blossom is a particularly attractive feature of this variety, being a deep solid crimson red - making it an excellent ornamental feature in the spring garden. 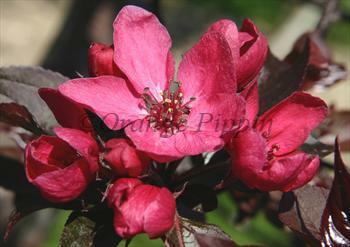 As you might expect Tickled Pink is also a useful apple for the kitchen. The slices keep their shape when cooked, and have an attractive pink colouring. The juice is also pink. Tickled Pink® is a protected variety. 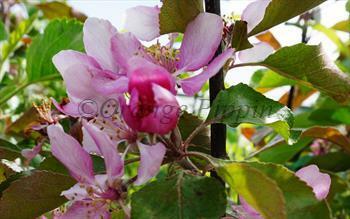 Please fill in the details below and we will let you know when Tickled Pink apple trees are back in stock. 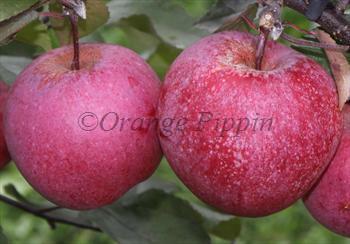 Probably the best-flavoured of the pink-fleshed apple varieties, and produces lovely pink juice. An unusual new apple variety with a unique combination of orange skin and pink flesh. Drying / Discoloring: No discolor / Good for drying? Tickled Pink is in flowering group 4. Tickled Pink is self-sterile and needs to be pollinated by another tree of a different variety nearby. Tickled Pink has been developed specifically for the commercial grower and amateur gardener and has greatly improved horticultural characteristics over some of the earlier red-fleshed apple varieties, including better scab tolerance. The main thing to look out for is over-cropping, which can be addressed by thinning the fruitlets in June. Germany 2009. This variety is registered under the trademark name Baya® Marisa.